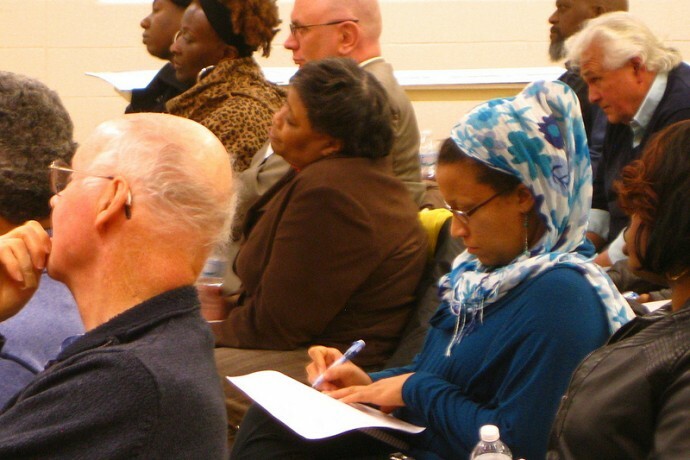 Residents get an update on what's happening in the neighborhood. New facilities and jobs in Lindsay Heights were the focus of a semi-annual meeting to update residents on the Lindsay Heights Neighborhood Initiative. The event also marked five years since the completion of the community’s Quality of Life plan. Walnut Way, the lead agency for the initiative funded by the Zilber Family Foundation, suffered a setback in late September when a fire damaged its community center at 2240 N. 17th St.
“We had a fire that closed our office, but it could not close our spirit,” said Sharon Adams, program director at Walnut Way. Panelists discussed new and ongoing physical development, including the Innovations & Wellness Commons, where Walnut Way plans to house its new headquarters, and the St. Ann Center for Intergenerational Care, a South Side institution that is expanding to the North Side. Neighborhood residents and visitors filled an upstairs cafeteria at the Northside YMCA, 1350 W. North Ave., to listen to the briefing. The Innovations & Wellness Commons, at 1635 W. North Ave., is intended to “lead the transformation” of an undeveloped section of North Avenue into a new commercial corridor, according to a pamphlet distributed at the meeting. St. Ann Center plans to break ground on the intergenerational daycare center by May 1. The facility will be built on land near North Avenue and 24th Street. According to Sister Edna Lonergan, president of St. Ann’s, at least half of the construction will be done by minority contractors, and the project will provide 200 jobs. Lonergan said the “world-class” building will serve people of all ages and disabilities and will include a facility for people with Alzheimer’s disease. Tim McCollow, project manager of HOME GR/OWN in the city’s Office of Environmental Sustainability, said Lindsay Heights was chosen as the initiative’s target neighborhood. The project is intended to re-purpose vacant properties for food production and distribution. The city is working with local organizations including Walnut Way and the Zilber Family Foundation to help address foreclosures and food access in the neighborhood. “We have the land, the community and the political will to transform Lindsay Heights,” McCollow added. Other organizations represented on the panel included Johnsons Park Neighborhood Association, Center for Resilient Cities, Neu-Life Community Development, Running Rebels Community Organization and Northside YMCA. A number of visitors from outside the neighborhood attended the briefing. Andrew DiMezza, a Harambee resident, is considering buying a home in Lindsay Heights. DiMezza, who belongs to an urban homesteading cooperative, came to the meeting to learn more about the HOME GR/OWN initiative’s efforts in the community. Sakeena Jawad, a Sherman Park resident, facilitates women’s healing circle groups with funding from Walnut Way. Curious about volunteer opportunities, Jawad attended after seeing a flier about the organization. 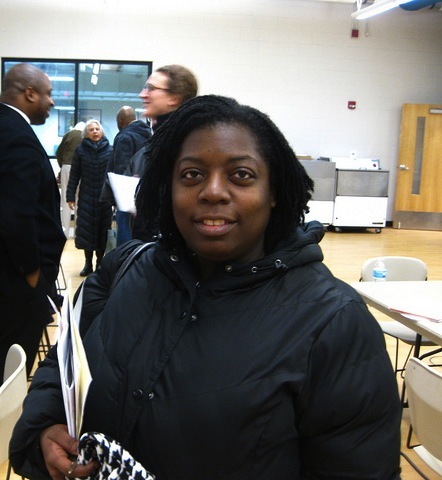 One of those residents is Francesca Dawson, an advisory board member at Walnut Way. Dawson has attended every community report since the Quality of Life Plan began. “I would like to continue to see the residents work together and move ahead on the plan for our children, for the future of the neighborhood of Lindsay Heights,” Dawson said. The Lindsay Heights Quality of Life Plan is focused on eight key strategies: academic achievement, youth and families, lifelong learning, public safety, health and wellness, healthy food, housing and commercial corridors. The next Report to the Community is scheduled for May 19.